Fluffy eggs and tender shrimp! Stuffed full of fragrant fried rice, topped with an aromatic sauce and red pickled ginger. Although Chinese-inspired, Tenshin-chahan originated in Japan! The Napolitan, a Japanese take on pasta. Despite its namesake, the Napolitan can't be found in Naples—but it is available on Peach in-ﬂight menus! You’ll love the homey taste of pasta sautéed in a hearty tomato sauce. * Prices show in Japanese Yen. Only with Peach: Negiyaki green onion pancakes! Batter is poured onto a generous heap of green onions, and slowly grilled to perfection—bringing out the sweet green onion flavor, then topped with cheese. Must try item! 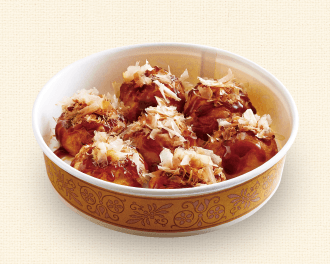 Only Peach can bring you the taste of Dotonbori, Osaka! Perfect combo meals for those looking for lighter options and value. Choose one of three kinds of bread and a hot drink. Alcoholic beverages (excluding wine) are served with an original Peach snack except when ordered as part of a set item.